Cover Love: I don't particularly like this cover, but it does represent what the book is a little bit about. If you look at it in certain ways, that is. 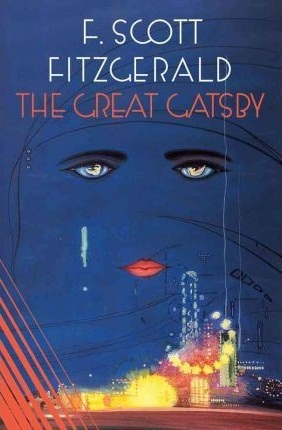 Self-made, self-invented millionaire Jay Gatsby embodies some of Fitzgerald's--and his country's--most abiding obsessions: money, ambition, greed, and the promise of new beginnings. "Gatsby believed in the green light, the orgiastic future that year by year recedes before us. It eluded us then, but that's no matter--tomorrow we will run faster, stretch out our arms farther.... And one fine morning--" Gatsby's rise to glory and eventual fall from grace becomes a kind of cautionary tale about the American Dream. I read this book for class and ever since the movie came out I had been meaning to see it. It was good, not fantastic, but good. I kind of hated it in a way though, but that's just because of the way we broke the book down symbol-by-symbol, scene-by-scene. But if you're reading this book for pleasure, you probably will enjoy it. It's a fun, short read. A bit dull at some points, but attention grabbing at others. And I read the book before I saw the movie, which ultimately made me understand the movie a bit more. I appreciated the characters more in the book, too. You grow attached to these people, but I hated them all. Every single one of them, yes, even Gatsby. They were all arrogant and ignorant to the real problems in society. Although, that is the deal back in that time period, I hated them, regardless. But with this kind of classic, you can form your own opinions on the different problems. And even, the tragic end. I felt nothing towards it. I didn't feel anything to the end and after the final page, I felt nothing. Just that, it was good, but I wasn't emotionally attached to it like you are suppose to be with a good novel.